The Guru is the Truth itself…. We would like to express our heartfelt gratitude to our most Beloved Satguru Shri Mahayogi Paramahansa for accepting the invitation to come to New York and gracing us with his Pure Existence for the past two months. Truly it is difficult to grasp how rare it is to have the opportunity to learn from and experience a true Master of Yoga. 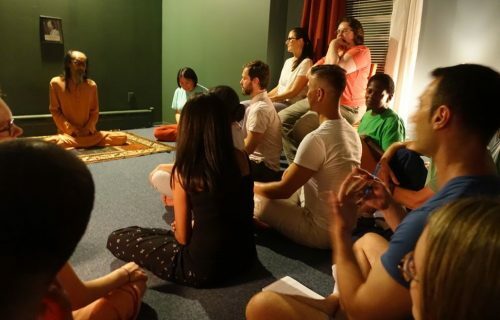 Yet this year, many seekers from a variety of different backgrounds had the opportunity to meet Shri Mahayogi for the first time, to ask the questions burning in their hearts and to experience the stillness that permeates everything around him. 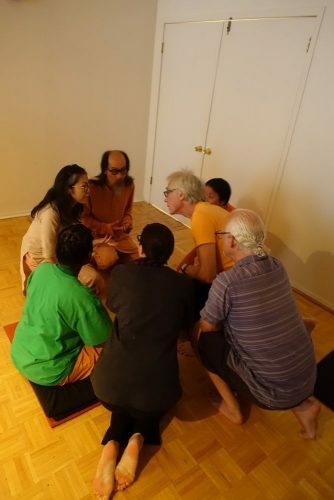 During this visit, Shri Mahayogi directed Asana and Meditation every Sunday and held two Satsangha, in which seekers gathered to ask the Master questions about the spiritual path. Topics ranged from the basic teaching of who the true Self is, to quantum physics, the teaching of the Buddha, the highest responsibility of a parent, the correct understanding of prayer, the mistaken understanding of the concept of sin and the true essence of all religion, just to name a few. Shri Mahayogi also responded to seekers’ earnest questions about how to deepen meditation, how to manage relationships, how to build faith, and how to confront desires in the mind. Shri Mahayogi pointed us the way to attaining Truth again and again with his words, while at the same time allowing our hearts to taste that Truth in the space beyond his words. Shri Mahayogi’s message to us all in the final Sunday Asana and Meditation Class was to establish and deepen in actual practice. Whether we have just met Shri Mahayogi for the first time or we are seeing him again after many years, it is a message for us all to take sincerely and earnestly into our hearts. The clues for how to put the teaching into actual practice are all around us. May we all open our hearts to see them and recognize that Awakening is REAL and it is attainable for all who humbly and passionately seek to experience it for themselves. May we all tirelessly apply with utmost sincerity these precious teachings that Shri Mahayogi has given us into every moment of our daily lives and continue to walk the path towards Truth, so that Shri Mahayogi may return soon to New York to grace us with his direct guidance again. We humbly bow down to the feet of our Beloved Guru. Jai Satguru Shri Mahayogi Paramahamsa, Ki, Jai!!! “I was so moved by every word—laughing, crying, taking in and feeling so thankful once again that this teaching is here to be taken as food for practice. The Satsangha in this month’s volume of Pranavadipa is coming from a small-group Satsangha that was held at the Mahayogi Ashrama in Kyoto just days after the first celebration of Sanatana Dharma Avatara Mela, the Grand Ceremony of the Manifestations of Divinity. Shri Mahayogi expounds on the teaching of Asana, the correct understanding of emotion, of family, of discrimination on Atman, and of the establishment of Sanatana Dharma, the Eternal Truth. The Testimony is a report on Shri Mahayogi’s first visit to Taiwan. Shri Mahayogi visited Taiwan for one week this past May 2017 and four Satsangha were held with well over 100 attendees gathering to meet with Shri Mahayogi for the first time. This Testimony, written by Priya, one of the staff members in Taipei who served as the Chinese to Japanese translator, contains an overview of the contents of those four Satsangha. The gratitude expressed for Shri Mahayogi’s visit and the opportunity that that visit brought for the people of Taiwan to meet an Awakened Master and to experience the direct teaching of the Truth is heartfelt and reminds us of how precious such an opportunity is. Pranavadipa is a Monthly Publication of Online Study Material containing the Teachings of Satguru Shri Mahayogi Paramahansa ＆ the Experiences of Practitioners that is available by annual subscription. A new volume of Pranavadipa is issued on the 8th of every month.